Please refer to our stock # T 1741 when inquiring. Reply below: Please click image for more info at end of description. 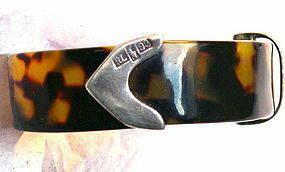 Smart animal print tortoise like pattern belt bangle expandable bracelet signed: RL, Polo mark and 93 impressed on what appears to be heavily silver plated "belt end metal part". The 93 could be the style #. 5/8" wide and expands to an oval of 2 1/2" across X 2 1/16". If not happy, please exchange. REPLY 2/4/14: Light polish will make this shine! Best fit for smallish to medium hand. Please choose the wrist you wish to adorn with this piece, straighten the hand as if a Miss America wave, tuck thumb in, measure widest part (including thumb), if 7 3/4" or less, it should be okay. Suggest slipping over a hand covered with a thin silk scarf. As coincidence will have it: if you wish this could include a Ralph Lauren green silk remnant of fabric (from the old designing and sewing artwear phase of this biz) to facilitate application. Please click the "Order/Inquire, then fill out the order form to keep a record of your order dialogue. For more info, please call 1 -7 PM EST 978-975-5148 and begin your message, at which time we can begin. Thank you for your interest in this very well priced piece!